Use these Fastaid blister plasters and feel the benefits of instant pain relief, with a gel layer to provide extra protection and comfort. Containing a selection of sizes, the clear plasters are perfectly discreet as well as being waterproof and breathable. Each plaster is individually wrapped and will remain securely on your skin, with incredibly easy application. The soothing hydrogel pads cushion the wound and promote fast, natural healing to prevent scarring and to keep you on the move. 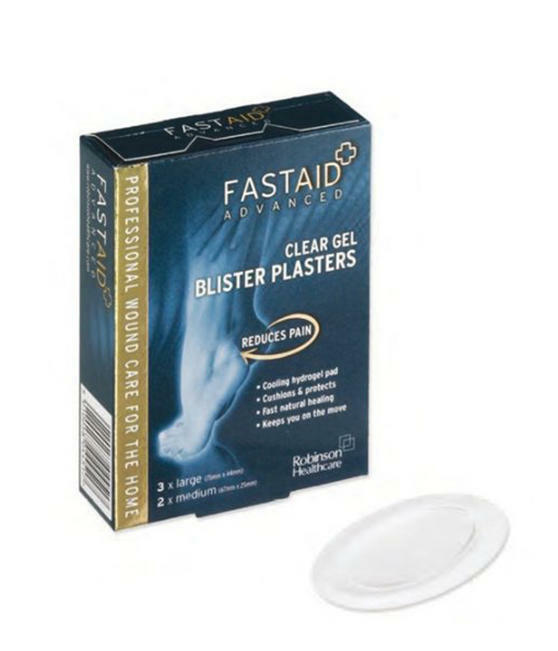 For instant pain relief and cushioned feel, this pack of Fastaid blister plasters are made with cooling hydrogel for advanced comfort. The pack includes a selection of sizes, with three large plasters at 75 mm x 44 mm and two medium plasters at 67 mm x 25 mm. Whether you are always on your feet or just have new shoes, the plasters protect your skin from discomfort and help wounds heal. Flexible and breathable, the plasters are perfect if you have an active lifestyle and will remain intact whilst you are on the move. With a sleek, smart design the clear gel plasters look almost invisible on the skin and promote fast natural healing.